A growing chorus of policy experts in Washington are calling for the United States to get serious about Syria. They want Washington to take charge of regime change, hastening the downfall of the Assad government. This is bad advice. The U.S. should not try to hit the fast-forward button on the process of revolutionary change overtaking Syria. It will end in tears, and Syria will end up a mess. The three greatest national leaders of the Middle East — Ataturk, Abdul Aziz Ibn Saud, and David Ben-Gurion — emerged as successful leaders because they won their struggle on the battlefield and did so alone, without the help of an imperial power. Building national unity is a long a painful process. It cannot be given as a gift. Syrians must win their own revolution. Syria’s opposition does not have leaders. Rami Nakhle, a spokesman for the Local Coordination Committees, the most well known of the groups opposing the regime, told Deborah Amos of NPR, “There is no national leadership, even behind the scenes.” This is a virtue and intentional. Nakle explained: “We are doing our best not really to have leaders.” Why? Because “the Syrian regime has targeted anyone who is seen as an organizer of the protests.” That is the practical reason. But the Syrian opposition’s lack of leaders has many U.S. policymakers scared. They don’t want to bring down the regime before there is some structure or leadership to take its place. 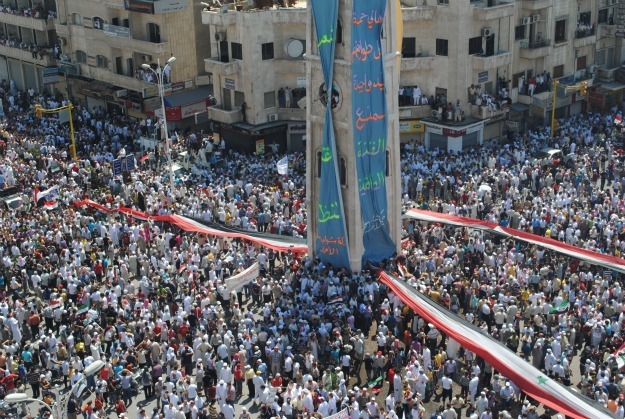 Syria’s silent majority is worried about a power vacuum developing in Syria as well. Iraq is fresh in everyone’s minds, not least for American policy planners. The quick toppling of the Iraqi regime brought militias and civil war. Much of Iraq that Saddam Hussein had failed to destroy was brought down by the warring militias and criminal gangs that took the army’s place. Most devastating was the flight of Iraq’s upper and middle classes. Because of this fear, a number of U.S. think tankers, most recently Michael S. Doran and Salman Shaikh of the Saban Center at Brookings, are trying to think their way around the dangers. In an article entitled “Getting serious in Syria,” they argue that the U.S. must play a leadership role in hastening the downfall of the Syrian regime. To avoid chaos and a vacuum, they advise the U.S. to train, unite, and shape the Syrian opposition. Washington should also preserve the army. They don’t want an Iraq redux. The body of the article is quite smart. They do an admirable job of outlining the regime’s weaknesses and sins. It is the recommendations that give pause. The main shortcoming of the article is that it skips any discussion of the opposition’s weaknesses. Most importantly, they ignore its disunity and lack of leadership. Syria’s chronic failing is that it lacks a deeply shared sense of political community. This explains why such a narrow regime as that led by the Assads, held together by a single family surrounded by a religious minority that makes up little more than 10 percent of the Syrian population could rule successfully for 40 years. If the regime has shown itself to be weak, the opposition is weaker still. It wants to challenge the system, but it evidently does not know how to proceed. It is split in a dozen ways between secularists, civil rights activists, democrats – and Islamists; between angry unemployed youths in the street and venerable figures of the opposition, hallowed by years in prison; between the opposition in Syria and the exiles abroad; between those who call for western intervention and those who reject any form of foreign interference. Doran and Shaikh dismiss Seale’s caution and close their eyes to Syria’s leaderless-ness. This permits them to advocate an accelerated regime-change. They explain that in order to save lives and ensure “the speediest rise of a new order hospitable to the United States,” the U.S. should organize a “contact group” of friendly nations which will help in shaping the environment such that a power vacuum does not emerge in Syria when the regime falls. Further, they suggest that, “The contact group should take all available steps to starve the regime of cash and other resources, including taking a leadership role on preventing the regime from generating revenue from oil exports.” On economic sanctions, they follow the roadmap set out by Andrew Tabler and Ausama Monajed. Randa Slim proposes a Doran-lite sanctions scenario, aimed at convincing Syria’s business elite to dump Assad and embrace the revolution. In a Middle East Channel article, entitled, “Where’s Syria’s business community?” she insists that Turkey must lead. The U.S. is too tainted to assume dominance in the contact group. In the eyes of Syrians, a close relationship with Washington will delegitimize Syria’s opposition leaders. The U.S. and the West in general, she cautions, must leave a “lighter footprint.” This is wise advice. Slim is clear about one thing: disunity among Syria’s opposition could doom the desire for regime change. The absence of an opposition leadership is the major stumbling block preventing the Syrian business elite from ditching the Assads, she argues. The key to success for the revolution is getting Aleppo and Damascus to rise up with the people of Deraa and Jisr ash-Shaghour. Syrian businessmen are a conservative and self-interested lot. They have a refined disdain for peasants and tribesmen alike; neither are they big on leftists, philosophers, religious fanatics, or zealots of any stripe. Indeed, Syria’s merchants and capitalists have rather high regard for themselves and few others. In their eyes, they are the true guardians of the Syrian nation. Their wisdom and moderation guided Syria to independence in the 1940s, avoiding sectarian bloodletting or humiliating foreign treaties. They bore with the Baathist mishandling of the economy, and spurned the Brotherhoods’ Jihadist pretensions in the 1980s. The only wisdom of the Assads, according to the Sunni elite, was their willingness to temper the nationalizations of the Nasserists, cut short the communism of the Jadidists, and most importantly take Syria’s capitalists seriously. Before they will help overthrow the Assads, they need a safe alternative. They are not going to embrace — not to mention fund — a leaderless bunch of young activists who want to smash everything that smells of Baathist privilege, corruption, and cronyism. After all, who are the CEOs of Syria’s crony capitalism if not the business elites of Aleppo and Damascus? We do not want this opposition to be molded by the left, which will be accompanied by lectures, theorizing and calamity for society and the economy. Steps to bring about reconciliation must be taken with the other sectors of civil society, particularly with national capital. Syria’s capitalists are not suicidal. They fear having their property expropriated twice in 50 years. Furthermore, they have become inextricably linked with the regime over the last 40 years, according to a number of analysts. Washington would be wiser to allow Syria to fill its own power vacuum. Once a united leadership emerges in Syria, it will be able to win the confidence of the majority and topple the regime on its own. There are dangers to short-circuiting that painful process. Doran and Shaikh argue that the U.S. should hasten both the destruction of the old regime and construction of a new one – in short, that it can nation-build and help guide the emergence of a new Syria. This will save Syrian lives, they project, because it will prevent a drawn out battle. But by helping to “fast forward” the Syrian revolution, the U.S. could be creating a Frankenstein. If the opposition doesn’t have time to produce a leadership that emerges organically out of struggle, Syria may never unite. The U.S. may cause more destruction and death, not less. To be truly successful, the opposition must come together under one set of leaders who win the confidence of the people by their intelligence, canniness, and most importantly, by their success. Joshua Landis is the director of the Center for Middle East Studies and associate professor at the University of Oklahoma. He is the author of the blog Syria Comment.